Sida rhombifolia commonly known as broom weed, paddy’s lucerne, Cuba jute is a short-lived perennial subshrub in the Malvaceae (Mallow family), commonly growing to 60 cm, but sometimes reaching 1.5 m in height. The plant is native to New World tropics and subtropics. Some of the popular common names of the plant are arrow leaf sida, arrow-leaf sida, arrow leaf sida, big Jack, bloom weed, broom weed, broomstick, coffee bush, common sida, country mallow Cuba jute, Cuban jute, flax weed, Indian hemp, jelly leaf, jelly leaf, Paddy’s lucerne, Pretoria sida, Queensland hemp, rhomboid ilima, shrub sida, sida retusa, sida weed, sida-retusa, teaweed and Broomjue sida. S. rhombifolia is not related to either jute or hemp). 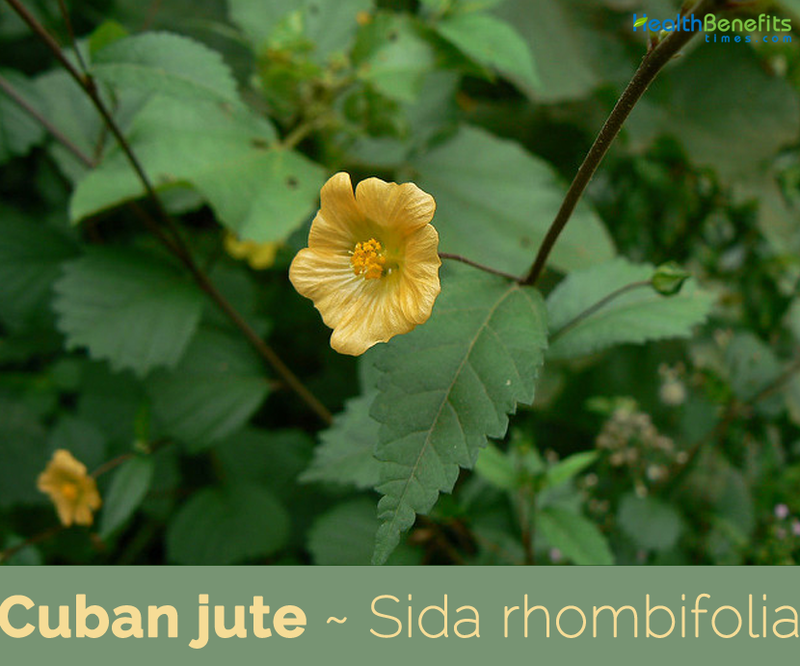 It is used in Ayurvedic medicine, where it is known as kurumthotti. This species is usually limited to waste ground, such as roadsides and rocky areas, stock camps or rabbit warrens, but can be cheap in pasture, because of its palatability to livestock. Cuban jute is an erect, short-lived perennial, woody herbaceous or sub-shrub that grows up to 2-3 m tall. The plant is found growing in cultivated fields, pastures, abandoned farmland, roadsides, vacant lots, construction sites, landslides, river overflow areas, wastelands, fallow fields, disturbed ground, sandy localities, grasslands, open woodlands, footpaths and gardens in tropical, sub-tropical, warmer temperate and semi-arid environments. It does not survive in tall grass swards, tall brush lands, and closed forests. The plant prefers to grow on both fertile and degraded soils of all textures and derived from most parent materials. The plant has deep taproot with many lateral and fine roots. The much-branched stems are slender, but rather woody, with a tough stringy bark. It measures 10 cm to 1.20 m high. 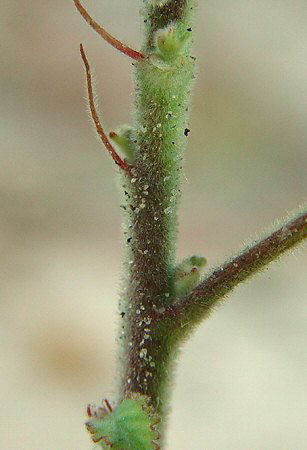 Younger stems are greenish and covered in tiny star-shaped hairs while older stems turn brown and become almost hairless. 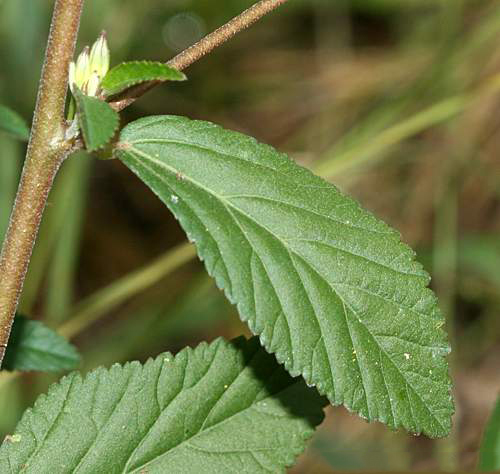 Leaves are alternately arranged along the stems and are borne on stalks 3-10 mm long. They have wedge-shaped bases and are usually widest about half-way along their length. These leaves are 15-85 mm long and 3-40 mm wide and are often diamond-shaped, but may also be oblong, oval or lance-shaped, and tend to be narrower towards the tips of the upper branches. The leaves are irregularly toothed towards their tips and are mostly entire towards their bases. The upper side is glabrous to densely cover with stellate hairs, of dark green color. Its underside is often grayish green in color and is covered with stellate hairs. Yellow to pale orange flowers about 15-20 mm across are produced singly in the upper leaf forks. They are borne on relatively long and thin stalks 1-4 cm long and have five petals that are 6-8 mm long. These flowers also have five sepals that are partially fused together and are sparsely covered in tiny star-shaped hairs. Flowering occurs from spring through to autumn, and is particularly abundant during summer. Fertile flowers are followed by slightly flattened or almost globular fruit that is 5-6 mm across and 2.5-3 mm high. The fruit is initially green turning to dark brown as they mature. When fully mature they separate into 8-12 one-seeded segments. 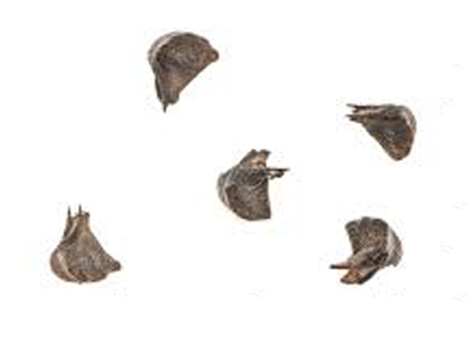 Seeds are wedge-shaped about 2-2.5 mm long, 2 mm in diameter and have two vertical ribs. They are dark brown or black and topped with two small spines (0.5-1 mm long) that bear tiny backward-pointing barbs. 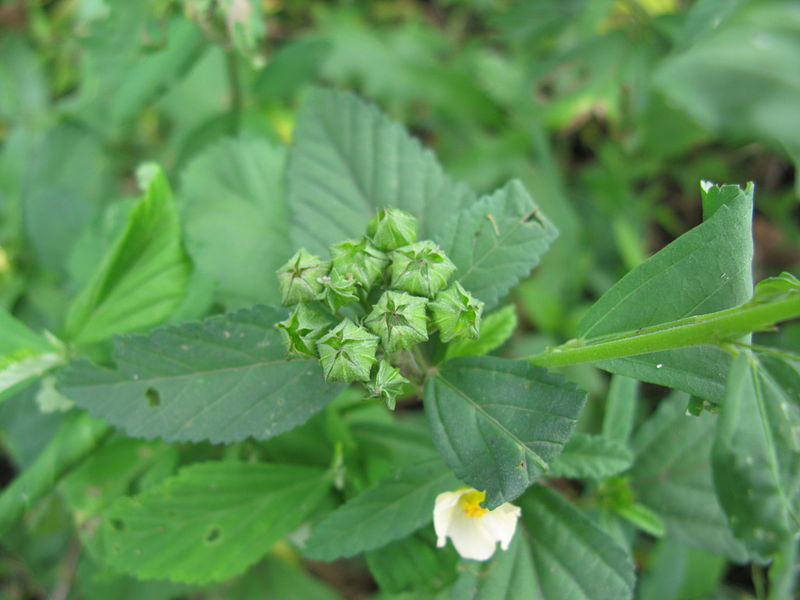 Flannel weed (Sida cordifolia) has broad or heart-shaped leaves that are densely covered in small whitish colored hairs that give them a felty texture. These leaves usually have rounded tips taper to a blunt point. Its flowers are borne in small, dense, clusters on short stalks (2-4 mm long) and their sepals are densely hairy. The fruit break up into 8-10 wedge-shaped ‘seeds’ that are topped with two long slender awns (2.5-3.5 mm long). Spiny head sida (Sida acuta) has elongated leaves that are hairless or sparsely hairy on both surfaces and have pointed tips. Its flowers are borne singly or in small clusters on short stalks (2-8 mm long) and their sepals are mostly hairless. The fruit break up into 5-8 wedge-shaped ‘seeds’ that are topped with two sharp awns (0.5-1.5 mm long). Spiny sida (Sida spinosa) has elongated to relatively broad leaves that are sparsely hairy above and densely hairy on their undersides with blunt or pointed tips. Its flowers are borne singly or in small clusters on relatively short stalks (3-15 mm long) and their sepals are finely hairy. The fruit usually break up into 5 wedge-shaped ‘seeds’ that are topped with two sharp awns (about 1 mm long). 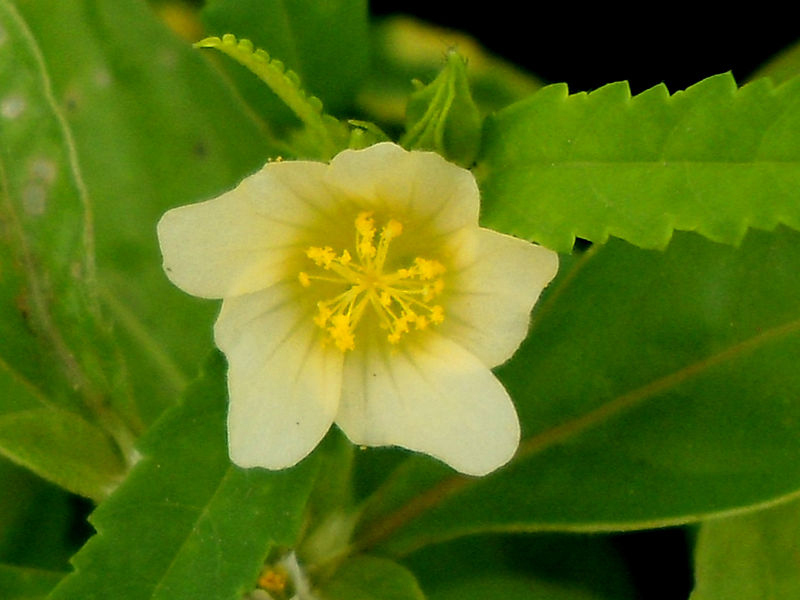 Spiked sida (Sida subspicata) has relatively narrow to broad leaves with a dense covering of hairs on both surfaces. These leaves have pointed or rounded tips. Its flowers are almost stalk less and borne in elongated clusters with a few small leaves sometimes interspersed between them. Their sepals are finely hairy and the fruit break up into 4-6 wedge-shaped ‘seeds’ that have rounded tips. Spiked malvastrum (Malvastrum americanum) has relatively narrow or broad leaves with a relatively dense covering of hairs on their lower surfaces and blunt or pointed tips. Its flowers are borne in short, dense, clusters that are subtended by leafy bracts and their sepals are hairy. The fruit usually break up into 8-12 wedge-shaped ‘seeds’ that have rounded tips. 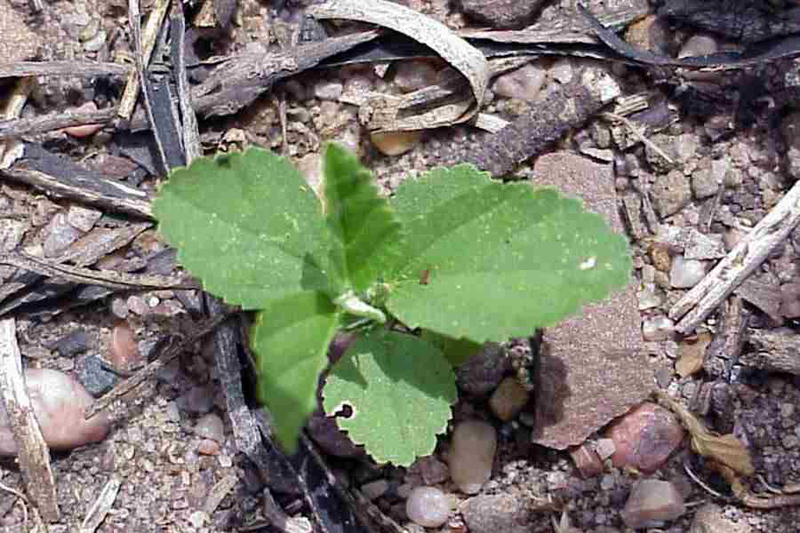 Prickly malvastrum (Malvastrum coromandelianum) has broad leaves with a corrugated appearance and only a sparse covering of hairs. These leaves have blunt or pointed tips. Its flowers are borne singly on short stalks (2-5 mm long) and their sepals are hairy. The fruit break up into 8-14 wedge-shaped ‘seeds’ that are topped with three sharp awns (0.5-1 mm long). Decoction of the whole plant is used as a treatment for fevers. 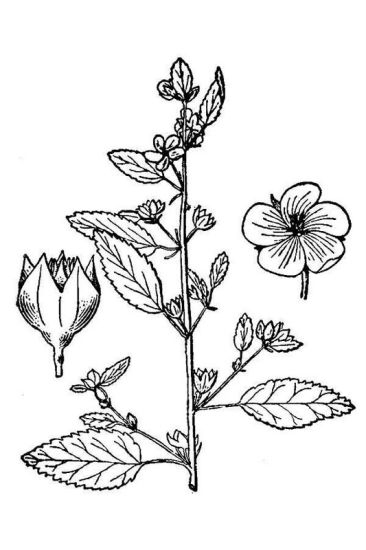 Paste of the plant is used to treat indigestion. It is also used as a poultice in the treatment of headaches, boils, cramps, rheumatism, toothache, chapped lips and pimples. Plant is ground and mixed with soft grease and sugar to make a poultice that is applied to soften abscesses and release pus. An infusion is used to treat dysentery. Juice of the leaves is mixed with vinegar to make an anti-inflammatory and digestive remedy. Decoction of the leaves is used to bathe wounds. Leaves are applied to the head as a poultice to remedy headache. Yellow flowers are eaten with wild ginger in order to ease labor. Root is scraped into sea water and the mixture drunk as a treatment for diarrhea, dysentery and abdominal upsets. Paste of the root is applied to boils. Pounded leaves are used to relieve swelling. Fruits are used to relieve headache. Mucilage is used as an emollient. Root is used to treat rheumatism. Australian Aborigines use the herb to treat diarrhea. In Alor, Eastern Indonesia the leaves are used to treat boils and the root is used to treat infant asthma. In traditional African medicine decoction of the roots and leaves are widely used as emollients. 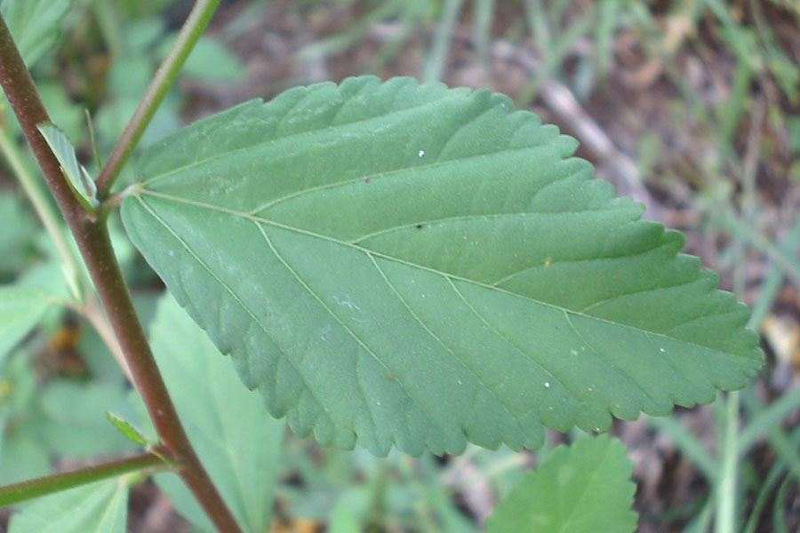 Leaves or the leaf sap are applied to the skin as an antiseptic and to treat abscesses, ulcers and wounds, for instance in Equatorial Guinea, Gabon, DR Congo, Tanzania and Madagascar. Roots and leaves or the leaves alone are used as an abortifacient. In Cameroon a watery maceration of the leaves is drunk as an anti-hypertensive agent, as a sedative, against sexually transmitted diseases and to cure diarrhea. Leaves and roots are used in Senegal, the Central African Republic and Madagascar for respiratory diseases like asthma, bronchitis, dyspnea and pneumonia. Flowers are applied to wasp stings or eaten to ease labor pains. Paste of the leaves mixed with coconut oil is applied to scurf and itch in the Philippines and Indonesia. 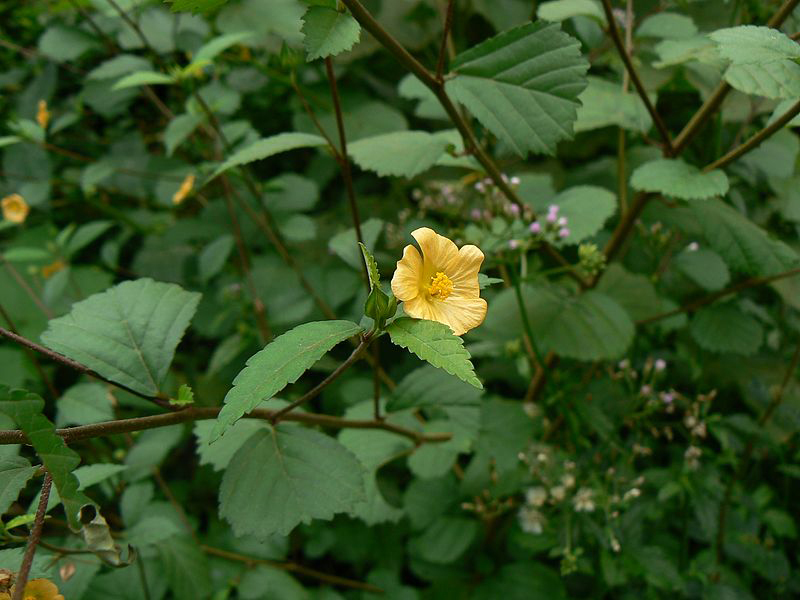 Plant has been used to treat pulmonary tuberculosis in Malaysia. Leaves are used to treat strained muscles, labor pains and migraine in Fiji and Papua New Guinea. Roots are chewed against toothache in Cameroon and Indonesia, and against dysentery in South-East Asia. Its preparations are used as external applications in swelling of wounds and inflammation of eyes. Oils prepared using this herb are very useful in arthritis and other diseases which affect joints. Oil prepared using this herb sooths excited nerves so it is used to massage patients who suffer from paralysis, cervical spondylosis, facial paralysis etc. 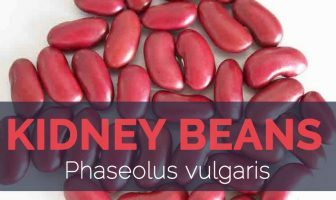 Diuretic properties of this herb help in cystitis and it rejuvenates urinary system. Roots when crushed with ginger, held in the mouth, for toothaches. Leaves and juice, taken by mouth for stomach cramps. Fresh leaves are mucilaginous and emollient and a cataplasm used to promote maturation of abscesses. Pulped roots applied to sore breasts. Crushed roots held in mouth for toothaches; also, chewed with ginger in Amboina. Root decoction has been used for bronchitis and asthma; also for fevers and various abdominal troubles. Decoction from any plant part used for irregular menses. 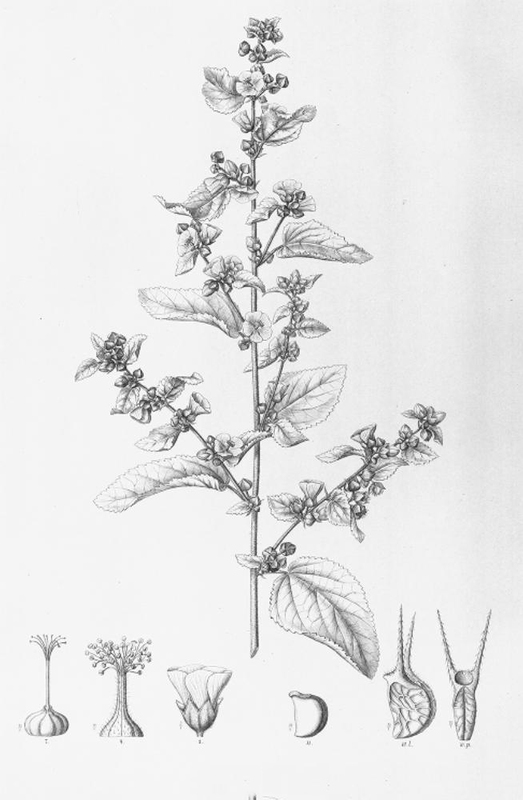 Plant poultice used as application for chicken pox. Tea is made from the leaves. Leaves are cooked and eaten as a vegetable. Leaves are smoked in Mexico and a tea is prepared in India for the stimulation it provides. In Indo-China, the roasted leaves are used for making a refreshing drink. Good quality fiber obtained from the bark is used for making ropes and twine. Easily extracted, it is a fine, strong, lustrous, white fiber. Stems are gathered in the morning, tied into bundles and then used as brooms. In Niger the fibers are used to make fishing-lines and nets and in the Central African Republic for making large hunting-nets. Stems are woven to produce wattle-work doors, and in Gabon and Kenya they are used for cleaning the teeth. Sida rhombifolia is appreciated as a fodder. 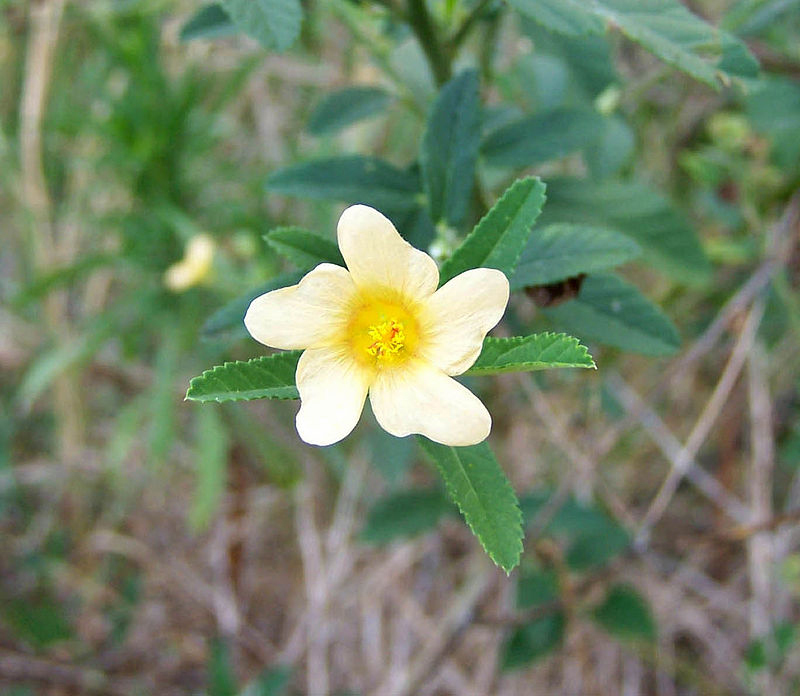 In East Africa, the wood-tar of Sida rhombifolia is used as a dye and in India it is used for blackening teeth. Leaves are used as a soap-substitute in Gabon and Kenya. Sida rhombifolia is considered a noxious weed in many crops and pastures. A single plant can produce as many as 11,600 seeds. Individual seeds have been reported to weigh between 0.0012 and 0.0015 g.
It may cause irritation, nervousness and dizziness.